I’ve always been just a little bit… different. Like, I have a hole above my right ear as a bizarre family birthmark, and in high school, my friend Jackie would put mechanical pencils in it and pump the lead to measure how deep it is. When I’m nervous or anxious, I like to shove anything I can find up my thumbnails (usually the edges of paper) because for some reason, it really calms me down. Also, when I was little, I thought the lyrics to Elton John’s “Tiny Dancer” was “Hold me closer, TONY DANZA.” To this days, it’s still all I hear. Quirks likes these have bled over to my professional life, too. For example, I’m a weird breed of Designer that believes design is more than a pretty picture. 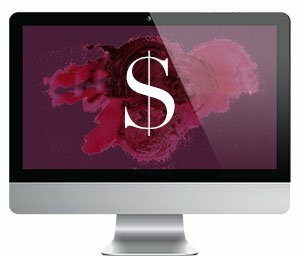 I believe that a proper custom web design has to look visually stunning, unique and one-of-a-kind, and has to represent the business’s personality to properly connect and establish trust with its audience. It also has to *work*, in terms of getting my clients more customers, more e-mail sign-ups, more social media fans, whatever the main conversion metric is. Though I’ve been a Designer since 2004, I didn’t start designing websites until 2006, and taught myself through trial, error, and entirely too many Google searches. I volunteered my services to friends and I was so excited to get them looking legit and professional online. One thing I noticed though, way back then, was just because I had built a website, and it was in fact online, that didn’t mean it would show up in search results when I ran a search query. To be honest, I would kiiiiiiiiiiinda freak out over this. I mean, when you work for your friends, you reaaaaaaaally want to see them succeed. I mean, why take the time to build a beautiful website with all the bells and whistles only for no one to be able to find you online, right? So I started to research, and was introduced to my nerdy love of SEO (Search Engine Optimization) and the art and science behind getting found online. Truly, I love SEO so much that if I ever get burnt out or fed up with design, SEO would prooooooooobably be my next career move. #nerdalert! 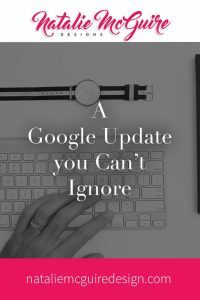 But, the rules for SEO are changing constantly. that no one can ignore. dip in organic website traffic to your site. If you’re not sure how your site stacks up on mobile, visit this site, and enter your website’s URL to see what the mobile verdict is. If the Google Gods determine your site is not mobile-friendly, you may want to contact your favorite Web Developer about what you can do to improve some of the errors. In the meantime, while your site is retro-fitted for mobile, you could invest in Facebook Ads or Google Adwords to offset the potential dip in organic website traffic. Visit the site and enter your website’s URL to see what the mobile verdict and make a plan that makes sense for you and your biz. Perhaps that means prioritizing the mobile fix, or maybe budgeting for an ad campaign to make up for the potential loss of web traffic. Then, I wanna hear from you. 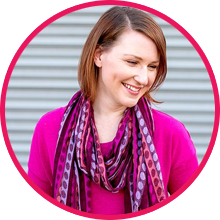 Simply come on over to my Facebook page and tell me how you plan to make a change to your site, or let me know if you’re already sitting pretty and popping champagne bottles!